The Estival Park Hotel offers golfers embarking on golf breaks to Spain a fantastic, four star accommodation option that offers comfort, style, superb facilities and delicious meals; all within a stone’s throw of local attractions including sandy beaches that stretch up the Mediterranean coastline, charming Catalan towns and, of course, a whole host of outstanding golf courses that are ready and waiting for your arrival. Guests staying at the Estival Park Hotel can enjoy a choice of over 800 bedrooms including doubles, duplex rooms and lavish suites for those seeking additional space and luxury. All the Hotel rooms have fully fitted en suite bathrooms, private terraces, telephone, air conditioning, satellite TV and safety deposit box. Dining options at Estival Park include three on-site buffet restaurants where breakfast, lunch and dinner can be enjoyed daily. The main basis of the food is Mediterranean inspired but guests can also enjoy additional international cuisine as well as pizza and snacks from one of four snack and poolside bars. Estival nights are full of fun and entertainment. Guests can relax in the piano and tapas bars or cut loose on the dance floor at the Hotel Disco. Golfers staying at Estival Park will have access to a number of top class golf courses which are all within a short drive from the hotel. 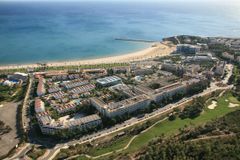 Look out for Lumine Golf & Beach Club and Costa Dorada Golf Club.